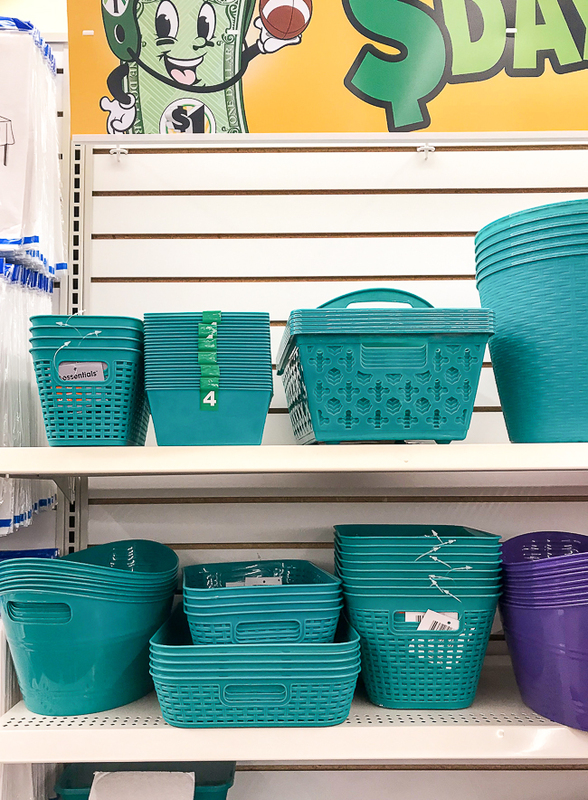 An easy way to make your own DIY Dollar Tree locker baskets! 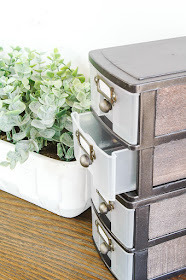 If you have seen any of my Dollar Store DIY makeovers then you know I love giving Dollar Tree items industrial and farmhouse inspired makeovers. I've updated, hacked and altered many Dollar Tree items and I'm back again with another super easy Dollar Tree storage makeover. 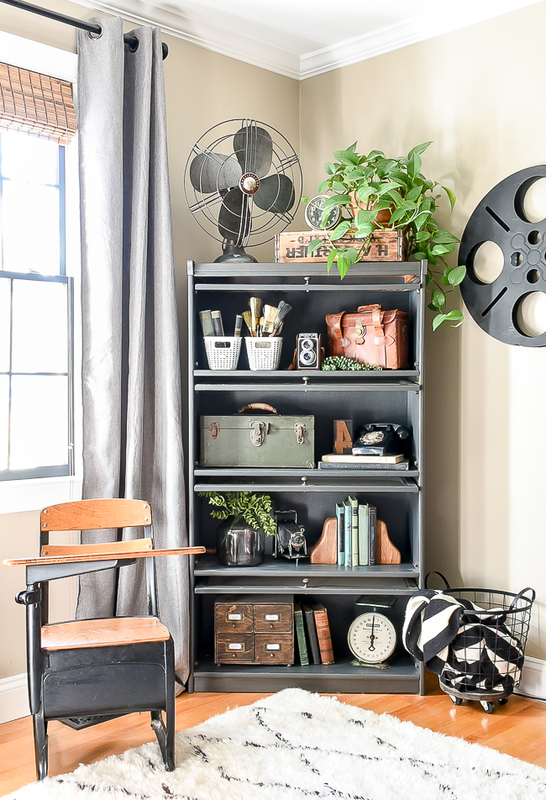 Today, I'm sharing how I took plastic Dollar Tree storage baskets and turned them into vintage inspired metal locker bins! 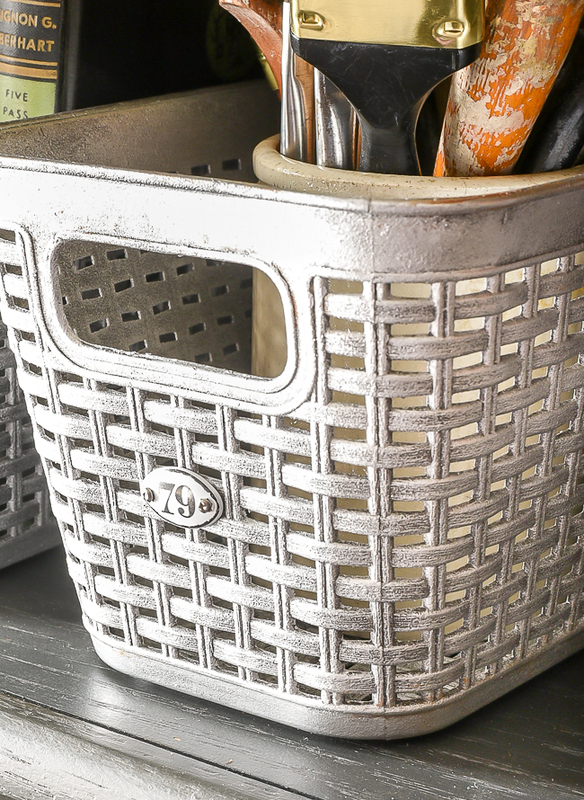 Some of my favorite Dollar Tree makeovers are storage items and now these little storage baskets are at the top of the list! January tends to be a time when Dollar Tree stocks new storage items that they don't always carry year round. 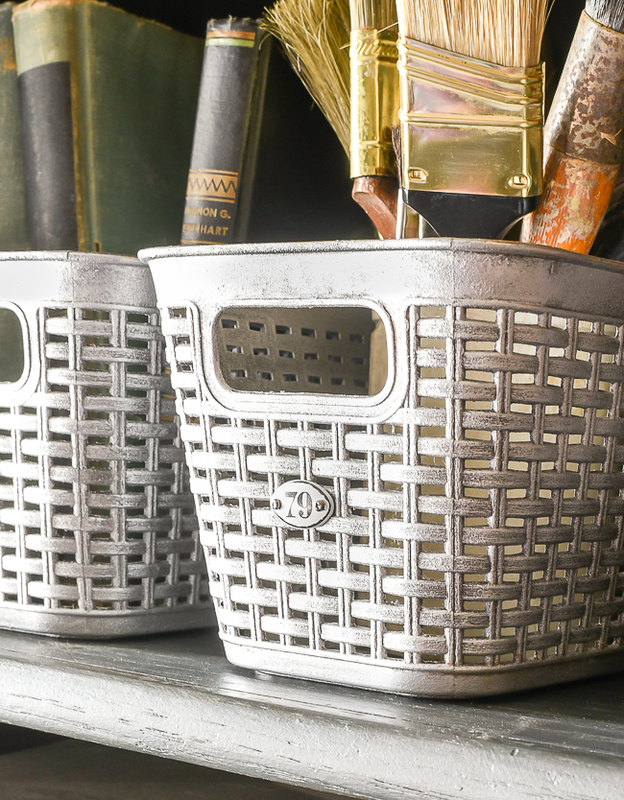 This year, I spotted new storage baskets that I instantly knew would make perfect vintage locker baskets. 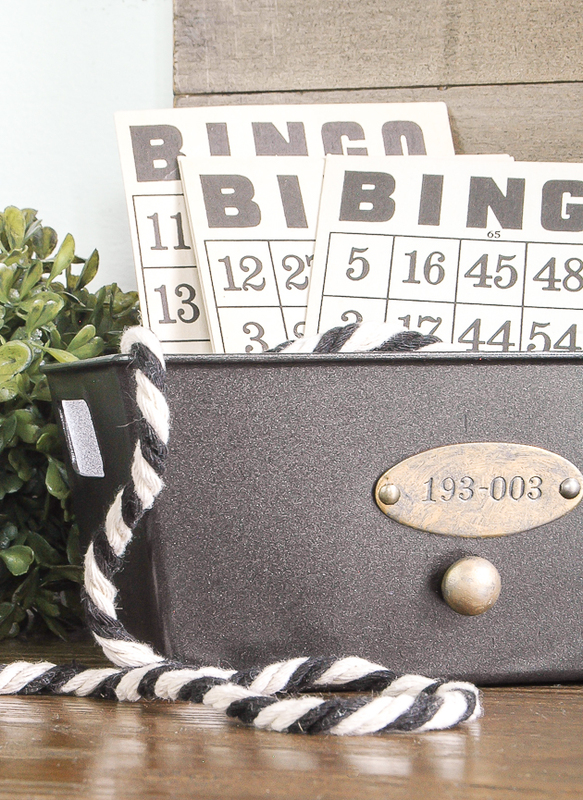 I have authentic locker baskets in my living room, so creating ones out of Dollar Tree baskets seemed like a no-brainer. The best part is, I already had all the supplies, including the white locker plaques, which I had bought from Michael's months earlier. 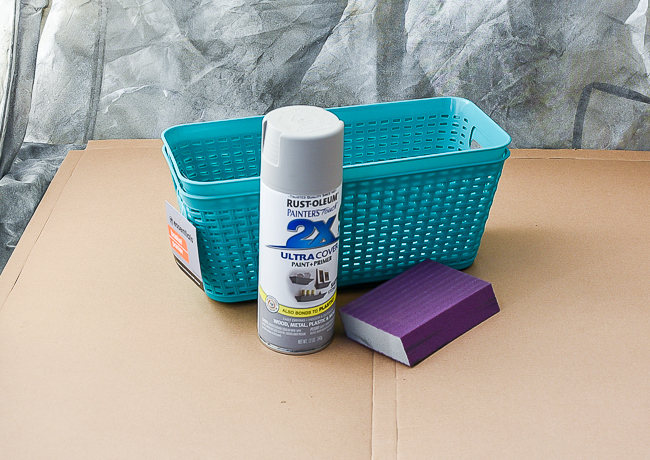 Lightly sand the Dollar Tree baskets using a fine grit sanding block. 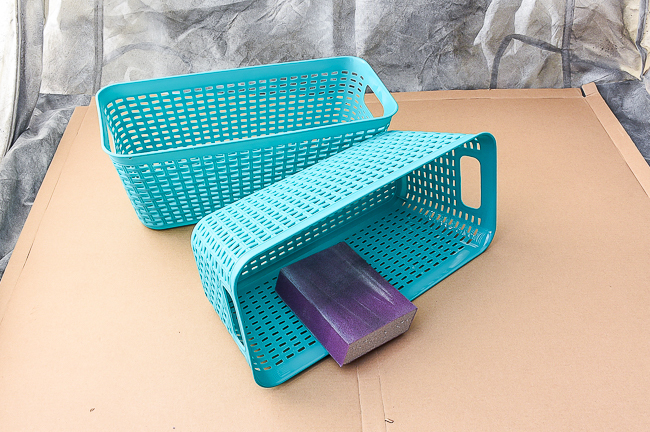 This will scuff up the plastic just enough to give the paint a good surface to adhere too without scratching the baskets. 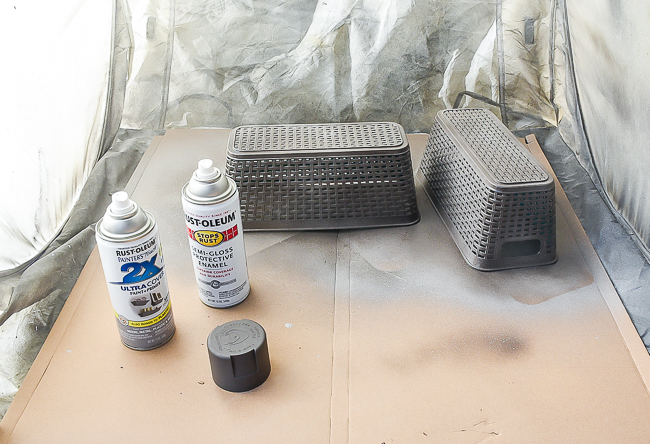 Lightly cover the baskets with a few light coats of dark gray spray paint. It's best to do light even coats while letting the paint dry completely between coats. 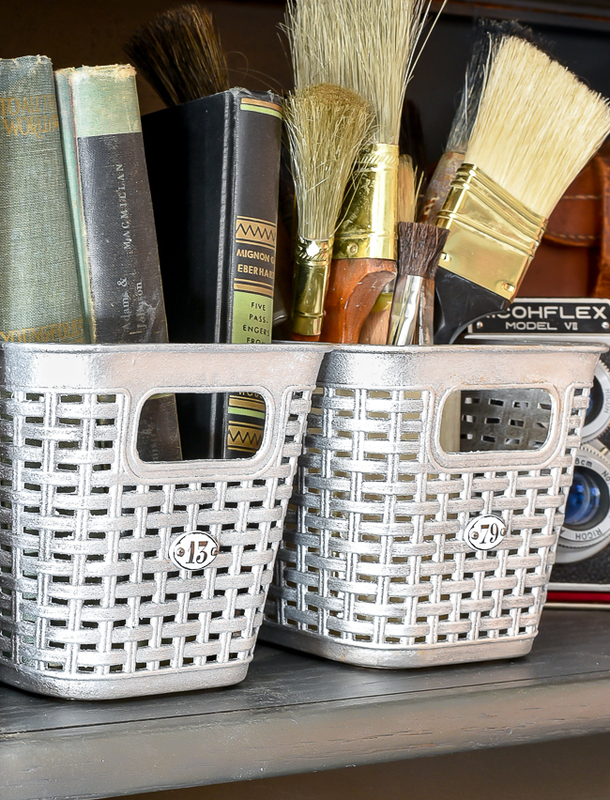 After the spray paint is completely dry, use a chip brush to apply pewter Rub 'n Buff to the baskets. 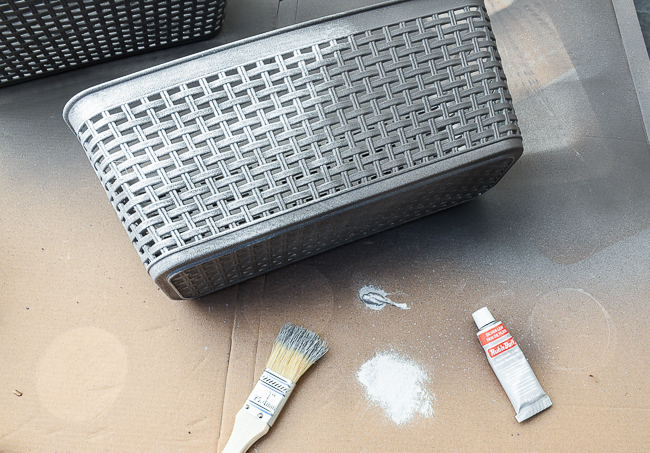 You want to kind of dry brush on the pewter Rub 'n Buff and not cover up the dark gray paint completely. 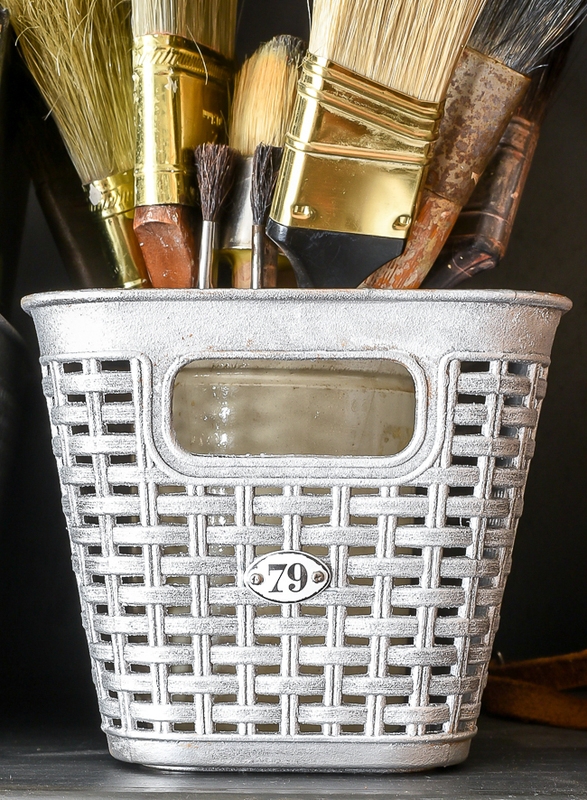 I found it best to squirt out the pewter paint onto cardboard, dip the chip brush into the paint then dab off the access before painting the baskets. Once you're happy with how the baskets are painted let them dry. Now it's time to attach the locker tags. 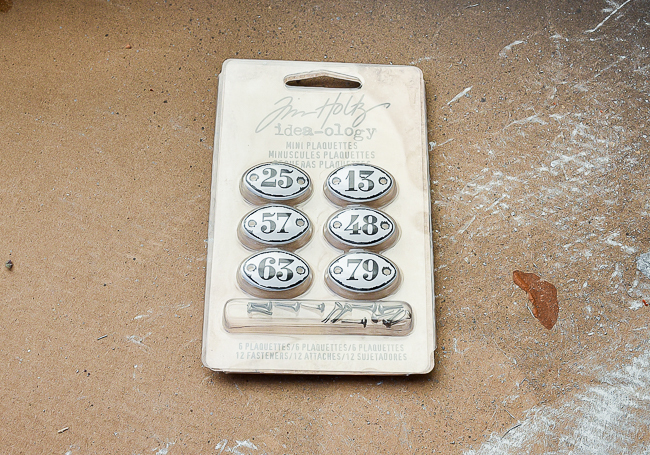 I could have used authentic locker tags, but I wanted to keep this project affordable and doable for everyone. The tags that I ended up using can be found for less than $5.00 on Amazon or at Michaels for around $3.00 with a 40% off coupon. What I love about these little locker tags/plaques is that they come with brads that look like nails. I just slipped the brads through the holes in the baskets then bent them open inside the basket. You can also add a dab of hot glue on the back of the brads to hold them in place. 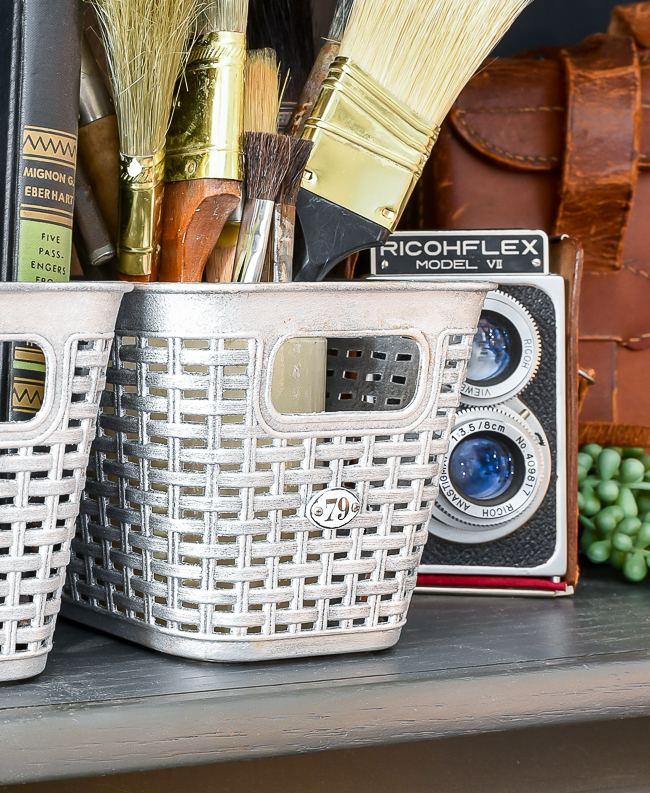 It's hard to tell in the pictures, but the variation of dark gray spray paint and shiny pewter Rub 'n Buff adds the perfect authentic touch to these DIY Dollar Tree locker baskets. You can see a bit more of the variation in color in the view below. I love how the baskets are plastic, but the combination of paint makes them look like metal. 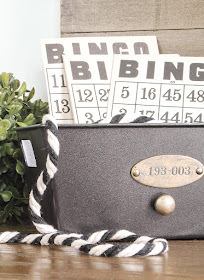 The inexpensive "locker tags" are also a great addition that makes these simple Dollar Tree storage baskets look like vintage locker baskets. I ended up moving the baskets into my office lockers and they're perfect for organizing tape and other shipping supplies for my Etsy shop!